Perrennial losing candidate Melchor Chavez continues to try his luck in landing in the Senate even if nobody thinks he will win. 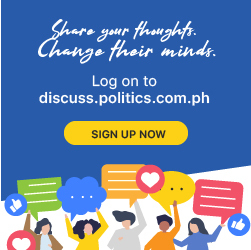 GMA News’ Jessica Soho asked Chavez why he was so doggedly determined to win as senator after applying eight times with the Commission on Elections since 1992 – five times he was declared a nuisance, three times he was allowed to run. He promised to match Duterte’s ferocity but he stressed he would only support Duterte on the right issues. He is counting on the votes of his peers in the Citizens’ Crime Watch which he claimed has 5 million members.